A stack of fishing net in the harbor of Latsi in the early morning. 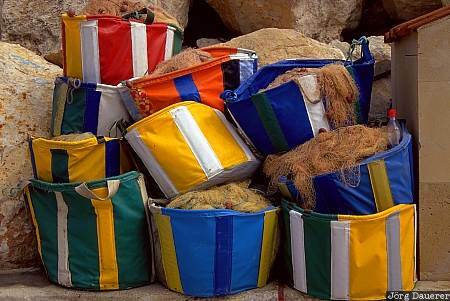 The local fishermen had just come back from fishing and their nets are stored for the next day in those colorful bags. Latsi is in the far west of the Mediterranean island of Cyprus. This photo was taken in the morning of a sunny day in April 2003. This photo was the image of the month in November of 2009.